Our mentor and good colleague professor Jean-Pierre Bourguignon, University of Liege, died January 30, 2019 less than two years after he was diagnosed with cancer. His death is a great loss for international endocrinology. Jean-Pierre was a paediatric endocrinologist and pioneer in translational research on the role of the endocrine system of the brain of children and young adults. His work helped advance the understanding of the hypothalamic control of puberty and led him to receive the 2014 Andrea Prader Prize, the most prestigious award given by the European Society for Pediatric Endocrinology (ESPE) in recognition of excellence. He graduated in 1974 as MD at the University of Liège (Belgium) and specialized in pediatric endocrinology. He obtained his higher education teaching certification from the University of Liège in 1984. His scientific career began under the mentorship of Paul Franchimont. Very early during is medical studies, he became interested in neuroendocrinology and his essential scientific focus was the neuroendocrine control of puberty onset and pulsatility of GnRH neurons in the hypothalamic arcuate nucleus. He performed several research fellowships in Richard Santen’s laboratory, Pennsylvania State University. 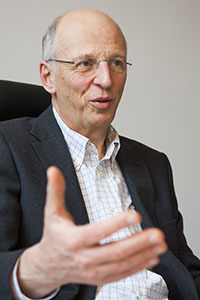 Until his retirement in 2015, he was the Head of the Developmental Neuroendocrinology Unit, GIGA-Neurosciences, Liège. The many graduate students, postdoctoral fellows and senior researchers who had the chance to work with him will remember is sharp scientific mind, his sense of humour and is passion for science. He accompanied his collaborators with pedagogy and generosity throughout their development. Besides his prominent role in this research field, Jean-Pierre was also an excellent clinician involved in the management of children with growth disorders and type 1 diabetes. Generous and conscious of the difficulties of young chronic patients, he shared with them his passion for hiking during several treks in the mountain which became a tradition. Another passion of Jean-Pierre was the transmission of knowledge. He helped establish and taught at the first ever ESPE Winter School in 1996. He initiated the implementation of problem-based learning in the Faculty of Medicine in 2000 and became Head of the Institute of training and research in higher education at the University of Liège in 2011. His rare teaching and human qualities have fostered many vocations for Pediatrics. He and his team were among the first to engage in the role of endocrine disrupting chemicals (EDCs) on puberty onset and trends in puberty disorders. During the last years before his retirement as chief of paediatric endocrinology, Liege University, this new focus of his research had become a main topic of his research group which received great international impact. His research background which included both solid clinical and experimental expertise helped the group to obtain a leading position. He then saw the need for more awareness about human environmental exposures and decided to engage in making the public and regulatory bodies aware about the roles endocrine disrupters for child development and health. In 2014, he was nominated as Co-president of the “Global Endocrine Disrupting Chemicals Policy Task Force” of the Endocrine Society (USA). His contributions received considerable international momentum, when he in 2016 received the Outstanding Public Service Award from the US based Endocrine Society for Leaders Raising Global Awareness of the Health Effects of Endocrine-Disrupting Chemicals. With determination, until the last days, he worked on his book aiming at informing citizens about endocrine disrupters. As he had done throughout his career, rather than taking the position of an omniscient expert, he motivates the readers to reflect and ask more questions. His scientific curiosity and his passion for child health advocacy will be an inspiration for all those who had the opportunity to work with him.